When adding embroidery elements to your garment, you can expect to see a professional and sleek outcome that reflects your personal or business brand. Embroidered garments give the opportunity to showcase your organization and members with style. In order for this to be possible, decorator companies use three distinct specialty embroidery stitches to create the beautiful custom embroidered garments you see. Each stitch creates a different embroidered look on the fabric. The first type of stitch is satin stitch, which will display a glossy, flat, and even texture resembling satin fabric. A satin stitch is the most commonly used stitch when it comes to embroidery. These shiny stitches are commonly used to outline letters, and work well for filling in small areas and highlighting larger designs. The stitches lie flush and neat against the fabric, which lack any raised padding, making them a functional basic stitch that has many purposes. In the fabric world, satin stitches can also be called damask stitches. The second type of specialty embroidery is walking stitch, but will often be referred to as running stitch. Whether the stitch is walking or running, it looks the same. The stitches look like long dashes, and may look hand-sewn. The walking stitch is used primarily for detailed work, and when used together create a nicely designed detailed image - such as a logo image. The single-line stitches are also used to outline images that can sometimes be combined with other types of specialty embroidery stitches to create a perfect image with a lot of attention to detail. Finally, the walking stitch is considered compatible with all types of fabric, making it the most versatile stitch. Used to fill big design areas with color, fill stitches can act as the foundation when used underneath other types of embroidery; especially when working to create a stable surface for detailed embroidery when sewn on light fabrics such as silk. Fill stitches are used to assemble many rows to create solid shapes. When using digitized embroidery systems, fill stitches can be made into patterns - ultimately offering variety to embroidery projects like weaving or chain. Though there are three basic specialty embroidery stitches, the walking stitch and the satin stitch are the most commonly used types. Each stitch offers its own look and texture, while the three stitches can even be combined to make a piece of custom embroidery that looks rich and detailed. Since fill stitches are raised, they add texture to an object, animal, or logo - while satin stitches are flat and elegant. 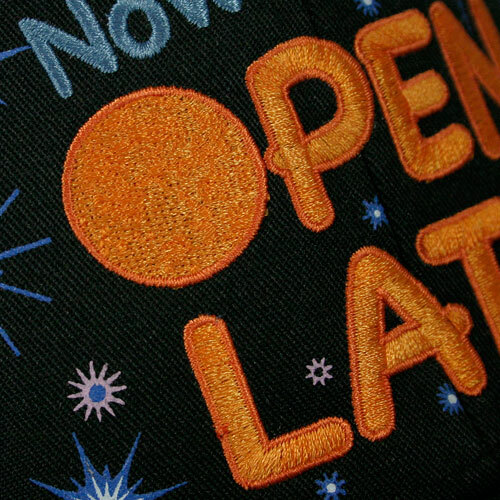 When professionals are custom embroidering a garment, they typically consider what type of material will be used before deciding on the right stitch. More importantly a good visualization of the final design, will ensure the perfect type of stitching for that particular piece.